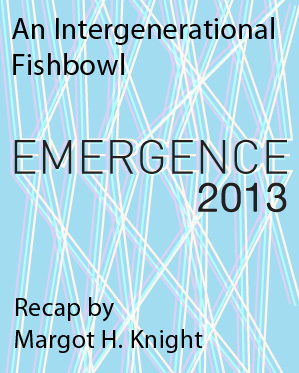 A fishbowl marked the finish of Emergence 2013, Emerging Arts Professional’s daylong annual convening on June 4. Even though they can discriminate against the shy, I like fishbowls. I like fishbowls because they provide a focal point for condensing experiences and thoughts. Fishbowls are round and provide a welcome break from the we-talk-you-listen square or oblong formats that stubbornly cling to the most innovative of conferences. Fishbowls focus on the learner. 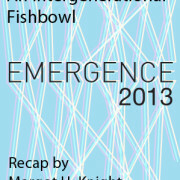 As teacher and then as learner again, I particularly liked the Emergence 2013 fishbowl because as moderator (the key to any successful fishbowl), Adam Fong did a great job of keeping the talkative fish swimming. So what did we learn? Here are my takeaways. The struggle for cultural equity ’twas ever thus whether the issue is art creation, arts audiences, arts organizations, or arts advocacy. All of which rolls back around to the roles privilege, power, and money play in the cultural sector. By the same token we are, each in our own way, blind to our own advantages in the world. We would all do well to take our own inventories and be as self-aware as our selfish, self-involved selves can muster. More important, each generation’s progress towards a more just and inclusive society stands on the risk-taking shoulders of its predecessor generation. Each generation has to find its own language, its own attitude and its own solutions. The cultural sector must also contribute to the definition of diversity, cultural equity, and cultural pluralism because sometimes, as Frances Phillips of Arts & Creative Work Fund/Walter and Elise Haas Fund noted in the opening panel, funders can screw things up by defining them. What if We All Worked Together? I felt a lot of “versus” undertones (we vs. they, big vs. small, new vs. old, old vs. young) and not enough if-we-all-work-together strategies. It sometimes felt like a convention of overwhelmed, put-upon people. Without whitewashing the economic climate for those new to the job market and emerging arts professionals specifically, the challenge is to find ways to stay in the field and not abandon it for greener for-profit pastures. I heard loud and clear that it’s not just about money when choosing a job—it’s about passion and principles. But the lack of a clear path to jobs with a desirable salary was a dilemma expressed over and over again in public and private conversations. Obstacles to more Bay Area collaboration within the sector are inherent in a field that encompasses varying disciplines, organizational structures, and umbrella organizations. It’s unclear who has the power and who uses it to convene the cultural community at large. It’s unclear who has the trust to represent the cultural community at economic development, policy and planning tables. Where should that kind of leadership come from? Only the designated heads of big budget organizations? Or can it come from the ranks of groups like Emerging Arts Professionals? If we don’t take the arts seriously and ask others to do so, whose fault is it that the arts are considered a frill? If we are not serious about our work, we might be unconsciously training other people how to treat us. For me, the conference’s promise of a day of uncommon learning was realized. I walked away buoyantly awash in the dedication of conference attendees to take on some pretty big personal, industry, and societal issues. The tension between the “longing for love and struggle for the legal tender,” as Jackson Browne sings, did nothing to diminish the passion and belief that the arts and artists matter. All we need to do is keep on listening, talking and taking action. The leadership of Emerging Arts Professionals is providing an open invitation to do that. Margot H. Knight is executive director of Djerassi Resident Artists Program. I participated in the Community Arts Education Leadership Institute last summer, a program which included a 360-degree feedback process, a week-long intensive seminar, and follow-up coaching. 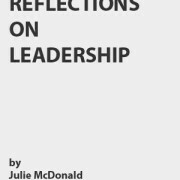 This experience has been a transformational learning experience for me, largely due to the rare opportunity to stop, reflect, and plan in the context of group discussions regarding effective leadership. In the past, I resisted taking the time to reflect on my leadership because I had a sense of guilt about taking the time away from other tasks I viewed as more practical. The importance of reflection finally hit home for me as a result of the profound connections I made with the group and the intense level of discussions which we were engaged in. As individuals, we never could have gained the depth of insights we generated as a group, nor the pragmatic applications and strategies that sprouted as a result of those insights. Each participant, having a different set of stories, experiences, and knowledge, made a unique and valuable contribution to the group through full participation. The safe, open, and supportive atmosphere enabled for participants, including me, to completely open up their hearts and minds. It was an enormous blessing to be both giving and receiving from such an inspired, diverse group of professionals. One of the most impactful, and somewhat horrifying, activities we engaged in was a 360-degree feedback process. 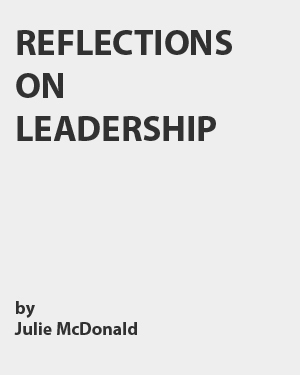 Fifteen individuals – direct reports, board members, colleagues and stakeholders – answered questions regarding my overall leadership competencies in areas such as vision, wisdom, communication, integrity, and conflict management. I could feel heart palpitations when I was handed the 40-page summary of their candid, anonymous interviews. This was the most comprehensive and structured feedback I’d ever received in my entire career, and I had virtually no sense of what might be inside. I was able to digest the information after taking several deep breaths and reading through it several times. Being thrust into this new level of the unknown had an incredible effect on my learning. I gained new awareness of my deepest strengths and validation on things I suspected I needed to work on (always that dreaded conflict management), as well as several eye-opening comments on communication issues with my organization. The supportive environment of the institute helped for each of us to further distill the results of our 360-degree reviews, and to create action plans around where we wanted to grow. Three months of coaching after the institute helped to bring our action plans to life. Since the institute ended over a year ago, I’ve been consistently engaged in this new practice of slowing down and taking the time to reflect on a regular basis, resulting in a heightened sense of awareness of my own strengths and areas for improvement, as well as a deeper clarity on my core values and how they can influence my decision making. I’ve also deepened my practice of requesting ongoing feedback from others in a structured way. Overall, my participation in the institute has enabled for me to be fully present and to make more meaningful contributions to others around me, my organization and my community. Julie is the executive director of Leap: Arts in Education.